The Hong Kong International Lighting Fair (spring edition) just ended on a good note. LED lighting companies seized the opportunity to market their products and reach out to potential partners and customers in hope to expand their market presence, especially in Asia, and bring more revenue to their businesses for the first half of 2019. Meanwhile, their competitions between one another are under heavy fire. In particular, LED filament patent war continues to be fierce. 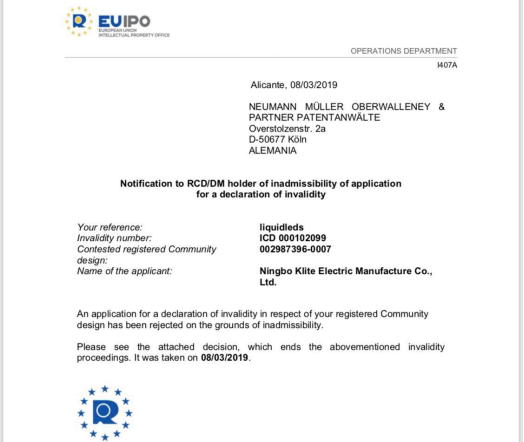 In the mid-2018, LED lighting company K-Lite Electric, after being caught right on the scene at Light + Building 2018 for showcasing patent-infringing LED filament bulbs, filed with the European Union Intellectual Property Office (EUIPO) a request to declare the invalidity of a patent held by Liquidleds Lighting Corp., a company specializing in developing innovative LED filament bulbs. However, the EUIPO rejected the application at the end of 2018. After Light + Building 2018, K-Lite Electric released an announcement denying being forced by the German Customs to take down their products and claiming the showcase went smoothly despite the fact that the incident was witnessed by numerous attendees, a few industry sources said. In the announcement, the company went on disclosing it already took legal actions against ‘the false accusation.’ Subsequently, it applied for the declaration of the invalidity of a Liquidleds design patent. 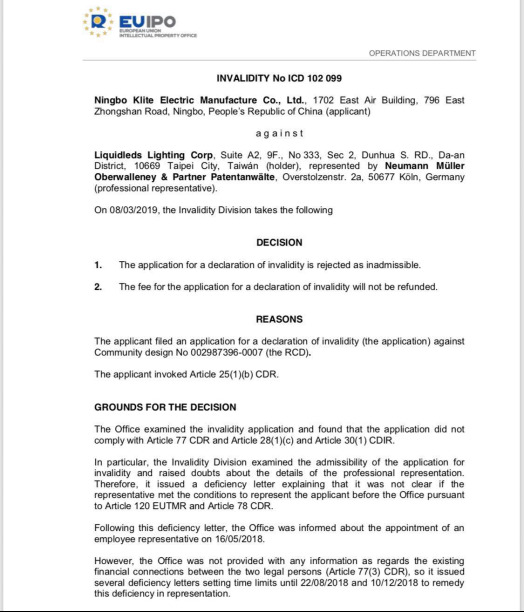 Nonetheless, in a recent document released by Liquidleds, it is found the EUIPO on March 8th 2019 rejected K-Lite’s application to invalidate Liquidleds’ patent. The EUIPO gave the grounds for the decision, saying ‘the Invalidity Division raised doubts about the details of the professional representation. [...] The Office issued several deficiency letters setting time limits until 22/08/2018 and 10/12/2018 to remedy this deficiency in representation.’ K-Lite, according to the announcement, did not resolve the deficiency identified before the due dates. The application was thus rejected as inadmissible. Liquidleds’ patent No. 002987396-0007 remains effective. LED filaments and LED filament bulbs are favored and see the most demand in the decorative lighting markets in the EU and the US. To get an upper hand in those market, LED companies have to refine their product quality (exterior & interior designs, heat dissipation technology, etc.) to stand out among all competitors. Intellectual properties, such as patents, are considered the embodiment of product refinement (quality). 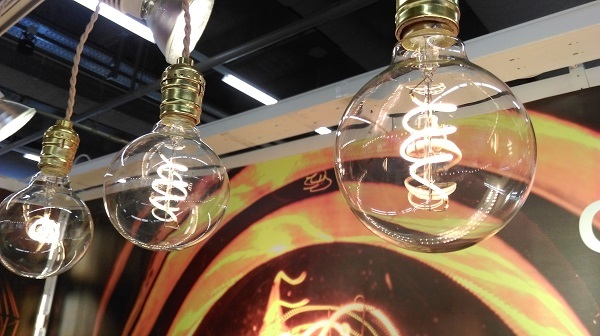 Manufacturers are normally required to have solid and innovative design capability to develop products of which the aesthetics matters, such as LED filament bulbs. Therefore, it is crucial for them to protect their development results by filing patents and those companies would go great length to prevent any forms of violation against their patents. The judgement of the EUIPO seemed to teach K-Lite Electric lessons that filing a request to invalidate competitor’s patent without enough evidence would not be processed and that a company should also make a notice to the Intellectual Property Office when deciding to drop a case in the mid of the process. Registering a patent with authorities for intellectual property in the EU and the States, such as the U.S. Patent and Trademark Office (USPTO), requires complete and detailed explanation of all aspects of the application, and so does requesting the invalidity of a patent. The company attempted to save its affected sales and reputation yet did not seem to think through the proceeding before making such a move, an anonymous source leaked. By contrast, as its main focus is on the European market, Liquidleds holds a comprehensive IP profile, covering multiple patents related to LED filament bulb design and manufacturing technologies, that underpins its business development in IP-emphasizing countries. In recent years, apart from Liquidleds, many LED companies, especially key players in the industry, also took actions, such as patenting their new technologies or extend existing patents, to protect their intellectual properties. It can be seen that LED companies are shifting their focus from competitions of price and quantity on to those of quality and intellectual properties, which leads LED technology progress to the next level.